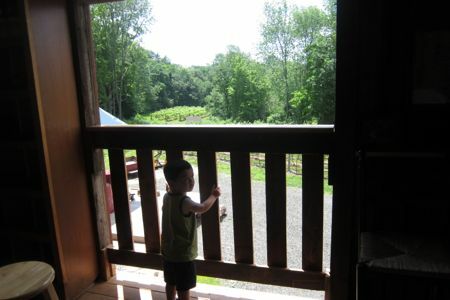 Connecticut’s wineries all have much in common, from the wines served to the tasting room set-ups to the countrified air about them. Even when you’re thinking about the big boys like Jonathan Edwards or Sharpe Hill as you enter the small driveway to Walker Road, you see all the same elements. Just on a much, much smaller scale. 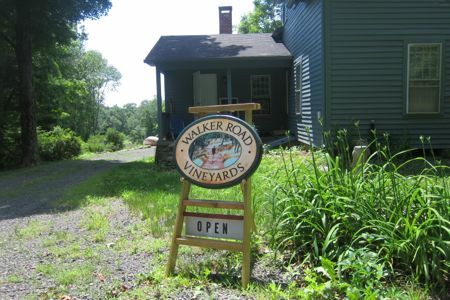 Walker Road has grown in many ways over the last few years (2011-2014), but they still are just a small family operation offering two wines. 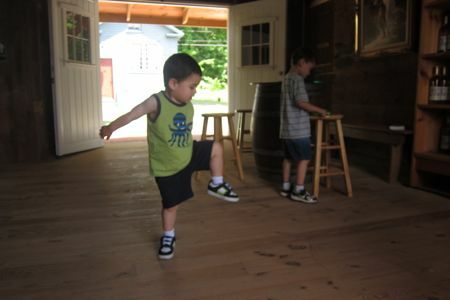 They’ve gone from a 3-seat tasting bench in their basement open a few days per year, to a beautiful refurbished barn tasting room open the first weekends of the summer and fall, to 2014, when they opened up a sort of tasting shed in addition to the barn and expanded their hours to include every weekend from June through November. 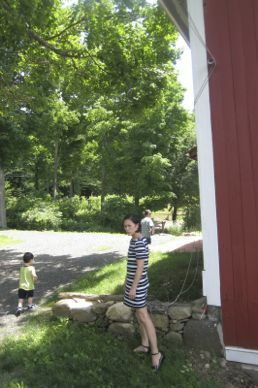 Note: Hoang is goofing around in this picture… she doesn’t really posey pose like that in any serious sort of way. 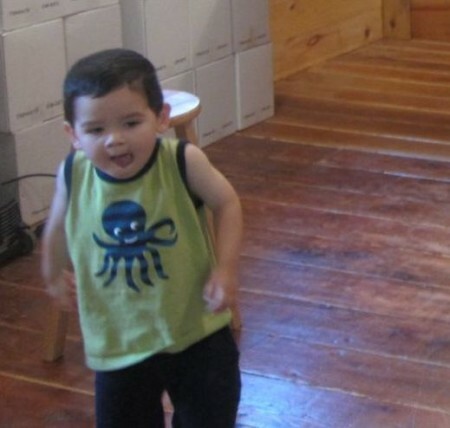 Of course, with room to run and relatively wide open spaces, Damian and Calvin will take full advantage; chasing and dancing and generally doing lots of things that people just don’t do in vineyard tasting rooms. Actually, wait. 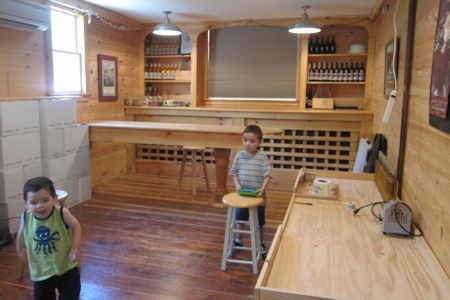 People get drunk in wine tasting rooms and do all sorts of idiotic things. My kids were fine. Anyway, we had wine to taste. I want to reiterate how pleasant and interesting Jim is to speak with. He has some great stories of travel as well as more about his passion for wine-making. 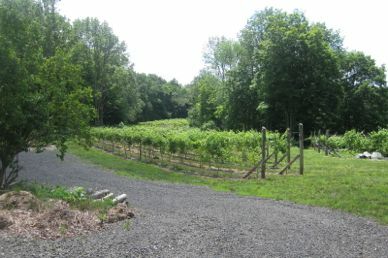 Walker Road had two wines to taste and purchase. The white blend is called Gertrude’s Garden, named after Gertrude Jekyll, the famed English horticultural designer and writer who was commissioned in 1926 to plan an “old fashioned” garden to enhance the newly Glebe House Museum in Woodbury. The garden is a Connecticut Historical Garden, and you can read about my visit here. The wine was serviceable, which is as good as Connecticut whites get for me. Slight citrus and other fruits throughout the process of drinking it. The red does not enjoy any similarly important nomenclature. For it is, simply called Red Table Wine: This red blend consists of the St. Croix, Cabernet Franc, and Sangiovese-Brunello varietals. That last one is a new varietal to me, not that I am any sort of expert though. I enjoyed the red… full of berry and pepper. We left the two hippies alone and returned to Jim for a few more stories about California and travel and life in Woodbury. He seemed to rather enjoy his life and welcoming visitors into his barn to have a chat. And really, to me, the wine becomes secondary after that. Actually wine and good conversation BOTH take a backseat to coming home and everyone taking a nap. Which is what we did.